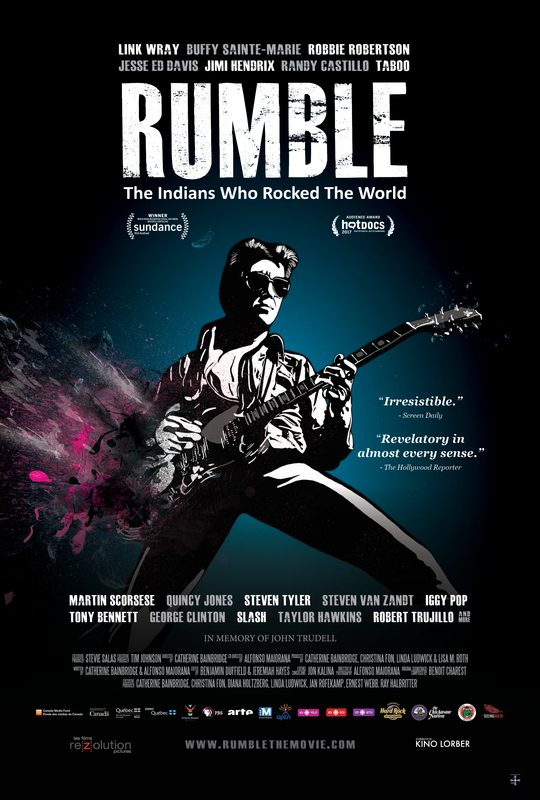 “Rumble,” the guitar instrumental recorded by Link Wray in 1957, is to modern rock music what the monolith was to those primates in the “Dawn of Man” section of “2001: A Space Odyssey.” If you’re ever on a quest for The Thing Itself in amplified music, “Rumble” is a convincer. Sure, Chuck Berry invented licks and riffs and a worldview that invented “rock n roll,” but Wray, with a surly distorted tone that one-upped the broken-amplifier crackle of Ike Turner’s axe on “Rocket 88,” helped invent “rock.” Hendrix, hard rock, heavy metal all owe him big. He’s the launching pad for this movie about Native Americans (here called “Indians” for reasons that become clearer as the movie goes on) and their influence not just on rock but on American music. As is pointed out more than once, the music of the Shawnee, the Choctaw, the Mohawk, the Apache, and so many other tribes, is in a very real sense the first American music. Race-mixing between blacks and Indians resulted in a cultural consciousness that enabled a melding of African music and Indian. Among other things, the movie makes a convincing case that the Indian tradition was one explicitly drawn upon by Charlie Patton, one of the giants of Delta Blues. It’s also peculiar that the movie drops Wray pretty much right after giving us the news that “Rumble” was banned from a host of radio stations, a signal accomplishment for an instrumental. “The theme song of juvenile delinquency,” Van Zandt says, delightedly. Wray’s subsequent career was as action-packed and eccentric as any rock figure you can name, and it doesn’t get played out here. Maybe they’re saving it for a separate documentary. But the stories the film tells after Wray’s are mostly well-done and frequently moving mini-movies. A section in New Orleans, featuring local hero Monk Boudreaux and several members of the Neville Brothers, is a superb précis of the roots of that region’s infectious music. Buffy Sainte Marie speaks of becoming a musician by happenstance, and suffering under a blacklist she wasn’t even explicitly aware of for almost twenty years. Robbie Robertson recount his procession from journeyman teen guitarist to Bob Dylan’s wingman during his controversial switch from folk to rock. “Be proud you’re an Indian but be careful who you tell,” he recalls his people advising him. The movie also examines the Indian roots in the work of Mildred Bailey, a pioneer for female jazz singers and a profound influence on some male superstars who came after her, one of whom, Tony Bennett, appears in an interview. The movie goes down byways you might not have expected: Taboo from Black Eyed Peas makes an appearance, and heavy metal shows up via both guitarist Steve Salas (one of the movie’s executive producers) and drummer Randy Castillo, who played with Ozzy. Their stories are among the movie’s most moving. Appropriately, “Rumble” ends at Standing Rock, North Dakota, with the sight of indigenous people protesting the Keystone pipeline, confronted by faceless authority figures who look ready to beat them down. The struggle continues. “We’re right and the world is wrong,” as Robertson said he came to believe in the period when he and Bob Dylan were practically getting booed off the stage every night.